Four Years Ago: I Lost My Hero – We Got This! Four years ago today I lost my hero. I lost the one I looked up to since I was born. I lost my protector, my world, my everything. I lost my big brother. Yes he is still alive, but it’s not Ryan anymore… it’s everything Ryan was, and everything he could’ve been. 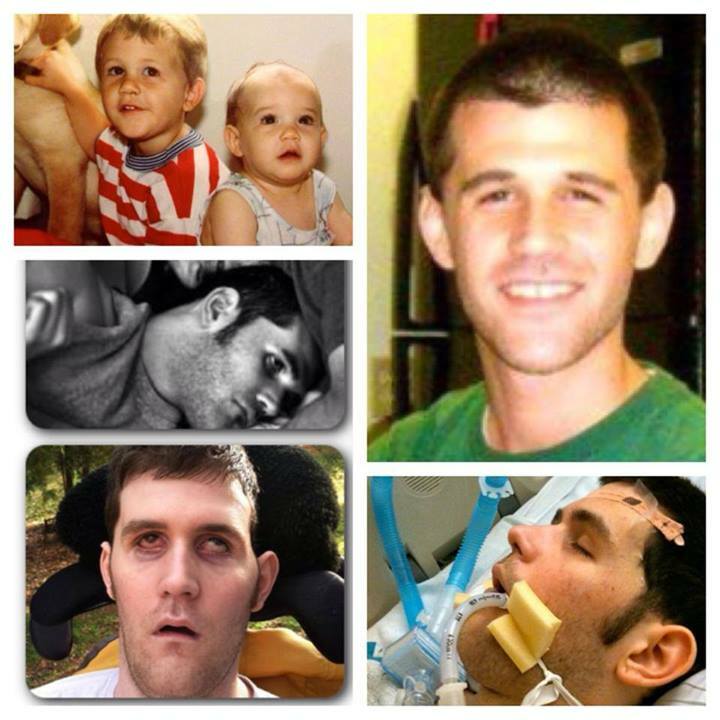 The Ryan I know now has traumatic brain injury that has left him in an Eyes-open minimally conscious state. My brother can’t speak… he can’t laugh… can’t tell us what or how he is feeling… and that contagious squinty-eyed smile he has in this picture has not been seen since November 7th of 2009. My brother, Ryan Diviney, was brutally attacked at the young age of 20 years old at the school he attended and loved, West Virginia University. My brother was a sophomore in college. My brother had a 3.8 GPA and received an award for making President’s List. Ryan knew everyone, and everyone knew Ryan. Ryan’s friends all called him Diviney, and Diviney was their goofy squinty-eyed friend who was passionate about everything he spoke about, and was notorious for talking with his hands. My brother knew how to make everyone feel special. He listened to everything anyone had to say and was always there to lend an ear whenever someone needed. Ryan was brilliant. He was funny. He was genuine. Ryan had the whole world ahead of him and he knew what he wanted to do with it. Ryan loved sports. He was a three-sport athlete and excelled in everything he played. Ryan could talk about professional sports all day and would stop and talk about them to anyone who would listen. He so enjoyed talking sports and getting into heated sports debates with his friends and people he would meet….but on the night of November 7th….he talked sports with the wrong people. The topic of debate… The 2009 World Series. As Ryan and his friends were walking together one night to get pizza stromboli from the Dairy Mart down the street from his college house… they passed a group of kids. Someone was wearing a Phillies hat and they started talking about who they thought was going to win…within a minute….you see Ryan being surrounded by the group (as seen on the official court video tape recording). You then see Ryan back-pedaling with his hands up until he is out of the frame. My brother was attacked that night along with his friend Brian McLhinney and a fellow high school teammate. Ryan has never laid a hand on anyone, and he was attacked as he was trying to get away. My brother was attacked and left for dead by two boys from Newark Delaware, Jonathan May and Austin Vantrease… two strangers. My brother’s body immediately started seizing as blood exited from his mouth nose and ears. Jonathan May and Austin Vantrease ran behind a dumpster and watched my brother as he was dying…then left him and proceeded on to a party where they bragged about how bad they beat him. Police were called by witnesses and Morgantown Officer Jimmy Smith was the first to help Ryan. Jimmy held my brother’s head until an ambulance arrived and took my brother to Ruby Memorial Intensive Care Unit. Officer Smith said he thought Ryan was going to die in his arms. My parents received the middle of the night, dreaded phone call that no parent ever wants to receive. The hospital called from my brother’s cell phone and instead of hearing my brother’s voice on the other line they heard a nurse telling them to get to Morgantown as fast as possible and that their son was found unresponsive in a parking lot. In order for Ryan to survive they needed to do emergency surgery to remove a part of his left skull to let his brain have more room to swell. If this wasn’t done Ryan would’ve died within hours… Getting the surgery alone was a flip of the coin to live… and we were warned he could die on the surgery table. Even after his craniotomy was performed, the doctors told us that they didn’t think Ryan would make it 48 hours. But against all odds, my brother survived that night. And he is still with us, fighting for his life every single day. Since I was born, it was always me and Ryan. Ryan was my only sibling and I was so used to having my big brother around all the time. Now, everything I do feels so empty. I know he should be here, with me, doing the same things… and he’s not. Every dinner there’s a spot missing. Every Christmas I read the Night Before Christmas alone…. Every time I see his Jeep Wrangler in the drive-way I feel like he should be driving it… He should be experiencing being young… He had so much more life to live, so much more to give. Ryan did not deserve this, my parents should not have had this happen to their son. No one deserves this fate. My brother was attacked when he was 20 years old… I was 18 at the time… Now I am 22. I am older than my older brother. Ryan’s life stopped when he was 20 years old, and everyday we pray for a miracle that one day… He and that squinty smile and goofy laugh might come back to us. No matter who you are, you can help keep my brother relevant by sharing his story and joining Team Diviney! So please, no matter who you are, your support means everything to us. Please share, whoever you are and help keep my brother relevant. My dad was not emotionally able to write today, but you must read what he wrote yesterday. It is title No, Not Today. He’s still a hero in my eyes. Kari, I got chills reading this powerful piece. You are an amazing sister and daughter. I ache for you and your family and will never stop believing in miracles. Prayers continue for all of you. Kari, Thanks for sharing your thoughts! I’m sure it was difficult. My thought, prayers and support are always with you all!! Thinking of you all this Thanksgiving season. Praying for a miracle for your family. Beautiful. Thoughts and prayers today and always for you, your parents, and especially for Ryan. Praying for you and your family. It breaks my heart that there are such mean people in the world that could do something so horrible to another person. So sorry for what your family is going through. I hope those responsible get punishment here on Earth and I am certain they will be punished come judgement day. God bless your family. I too have read all of these postings and i am so angry for the hurt everyone is and has been going through! I believe in Karma! What goes around! comes around! I am sure the awful louses that have done such an evil thing will burn in Hell! I am so Happy to hear the Love of Good People! God Bless! YOU Are all Blessings for all of us! Know that you have touched my Heart! I will pray for Ryan and your family. Ryan still has a purpose because he touched my heart tonight. Thank you for sharing. There are no words. What a beautiful tribute to your brother.This was just a senseless act of cruelty. Although, it doesn’t really help, I hope the 2 vicious animals that attacked your brother were properly tried and convicted of this heinous crime. God Bless you Diviney family. You’re in my prayers. Thank you so much for sharing Kari. Even in the state he’s in and my just learming of him, he is an inspiration. Many prayers for your entire family/friends. And you are his hero Ken. I am so sorry. I know this is a horrible month for you all. Hugs from St. Louis….I hope Ryan surprises everyone someday and breaks out his grin and awakens to enjoy life once again! I lost my brother four years ago this past May. The words you wrote today struck a chord in my heart. My brother is no longer here, and I miss him every day: his smile, the twinkle in his eyes, the silly things he used to say that only the two of us understood… and as much as it hurts to be without him, it hurts even more to see the pain my parents experienced through his loss, also a result of a senseless act. Prayers for you and your family, and especially for Ryan. My heart aches for you & your family .I just can’t stop the tears.Praying for you all .Please God Bless this family , I’m praying for a miracle . from north La. Thinking and praying for your family in Virginia. .. I just finished reading this very touching story about the loss, anger & love – so much love you have always felt for your big brother. I feel such terrible agony for the brother you care so deeply about, but know deep in your heart that Ryan “died” that fateful day a few years ago. His body is still alive, but his brain is not. What has to be the hardest is never really knowing how much your brother comprehend. Ryan is trapped deep inside his shell, unable to communicate in any way. I’m sure you ave asked yourself over and over, why? I called all three of them on my cell. We discussed what you have been through. After prayer with each son, I asked each of them the same question. If this situation exact situation happened to your brother, would it be easier, knowing how much brain damage occurred, would it be easier to have to bury him or have him like your brother is today. As I expected each son replied, “there is no way to answer that Mom. Only God decides our outcome”. As difficult things are with your brother, where there is life – there is always hope. Thanks for sharing your heart & soul. Sandy Reckeweg, Waldorf Maryland. I read your story and I want to tell you that your family will be in my prayers. Two years ago I lost my son who was 27 years old. It was a tragic auto accident that took his life and his friend. I miss my son, he was my youngest son. He had a smile and a way about him that would make anyone love him. He and his older brother were brothers but yet they were also best friends. I wonder every day about all that he is missing. I read a church sign the other day “Remembering but moving forward”. How true yet how sad. God brings us into this world for a reason and he will some day take us back to his home. I will see my son again, I just wish I could hold him and kiss him here on earth again. God be with you and your family. I lost my older brother ( only sibling) 5 years ago. I know exactly the emptiness that you feel. Especially during the holiday seasons. My brother was on life support for a month, but I made the hardest decision of my life, and he was removed on Sept. 26, 2008 and passed away on Sept. 29, 2008. I will keep your family in my prayers. I am so sorry this happened to your brother and your family! I will be praying for your family! God Bless you! Kari, much like mom and dad, heart wrenching writer. I think I understand you more because I don’t have any children. I lost my cousin who was like my sister. This was 35 years ago, I wonder how my life would have been different had she lived. I am sure we shopped at that Dairy Mart a time or two. Today we were called to the hospital to be with my father in law as he demanded to have his ventilator removed. He seemed to do well and was cracking jokes moments after it was removed. I had to stand in the hall while they removed it, couldn’t stand the pain he might have been in, and all I could think of is Ryan, that 11/7 would be a day I too will never forget and a day that I would remember with dread. I did make him promise to keep breathing and to be there in the morning because I would rather have him around and growling than to not have him here. This entire day I have thought of your family. All that burdens my heart has already been said. I do want to say, however, that I am so terribly sorry that this tragedy happened to your brother. Your story is an inspiration for me and I hope for all people to let their loved ones know how much and how treasured they are. I believe that miracles happen everyday. All we can do is trust God and know that He is in control. Why Ryan is still with you, I cannot say, but because of my faith, I have to believe that God has plans for him in the days, weeks, months or years to come. He may be able to here you but not able to respond, so don’t give up. I will be in continual prayer for all of you. Someday, we will all meet in heaven and Ryan will be whole. God Bless your family and keep your faith. There is no room in heaven for the slugs who did this. Patty Paad, Enid, Okla.
Hi, I just want to say how strong and amazing you and you’re family are. I continuously pray for a miracle. This act of evil was absolutely disgusting, actually there is no word that is terrible enough to describe how awful someone must be to do that to another human being. For that, I am sorry. I hope you guys get justice for this. These two clowns should rot for life in prison. As for your brother, he is simply amazing. So strong and very much loved. He is still very much a hero, he has touched the lives of so many people. He is also extremely strong. I hope for the best and for a full recovery. The brain is a very mysterious organ, time is the best healer. Keep you’re heads up, prayers and thoughts are coming you’re way from myself and my family. Someone posted your blog on facebook and asked for everyone to read it. I live in NJ and I didn’t know anything about your story until today. As a new mom I don’t ever want to imagine this pain. Thank you for sharing this story it was beautifully written. From our family to yours we send our love and support! I’m so sorry. There are no words to explain how I feel about what happen to you Ryan. I can say is I’m sorry. My God be with your family in this thime. Such a sad story. I will pray for you all…. Kari, what a beautiful post. I was unable to post yesterday, but thought of you all during the entire day. I am honoring Ryan on this sad anniversary by making a donation to his care and hope others do also. Kari, you did an awesome job in writing this piece. I am the choir director here in Huntington at Community of Grace. We have another concert on Sunday, November 10th. All proceeds go to Ryan’s special needs trust fund. The power point is very moving and people are shocked by the story. Prayers for you and the family. My heart is with your family..I’ve never stopped thinking of you since the moment I heard about what happened…and I never will. Im wishing you all the strength and love in the world. I lost my precious brother in 2000 at the age of 29. Although your brother Ryan and my brother, Craig didn’t suffer from the same thing-your story touched me deeply. My brother was dx with a malignant brain tumor and over the 2 year battle, I watched him lose so much, and more difficult than the diagnosis itself, for my brother, the loss of independence was more traumatic. I, too, watched my brother turn from a young, vibrant, healthy, athletic, gorgeous, brilliant man with such a love of life into a dependent, bed ridden, unable to speak or move shadow of himself. I know your pain-I always looked up to my big brother and it was quite a heartbreaking adjustment to turn into one of his caregivers. Please know that Ryan’s story has touched and will continue to touch so many and never forget that there are soooo many people (most you’ve never met) that hold you in our prayers. Sending warmest thoughts your way and may the love of your great family and the love you all have for Ryan see you through the challenges of each day. Kari, you done an awesome job writting this story!! I lost my son at age twenty with the same injury. When I look at his pictures I see my son. Your heart will always be heavy with saddness. I know. I have felt that pain for the last 12 yrs. I hold out HOPE that your brother comes back to your family. None of us deserve the pain that others put on us!! I will always support you and your family. Miracles happen every day but only to those who believe in them. I hope you can find peace and resolve in your lives. I don’t know if I could. Be strong. I hope that Ryan wins his fight. Prayers coming his and your family’s way. I will pray with your family for a miracle. Keeping Ryan relevant from MN!! Holding the Diviney’s in my heart. I lost my son Nathan in April, My heart goes out to you. May Ryan come back to you it would be a true blessing. I would give anything to hold, kiss and tell my son just how much we love and miss him. Tears for Ryan. This story tugs at my heart. My prayers and thoughts are on their way. This shocking story is something you see on TV. Not at home. The story of Ryan is in my head and heart. May the Lord till Ryan “family and friends are waiting on you,get up and live your life”. Bless you Ryan. I still think about this and always will. He was such a nice guy. People who commit violent acts and have no remorse will never grow a conscience and will always be a threat to others. They should be locked up for life or executed. I and other members of my family were victims of a sadistic psychopath, and I am the only one who survived. I feel your pain and commend you for keeping your brother’s story alive. You are courageous! May God bless you and give you His peace. Wanted you to know prayers are still coming!